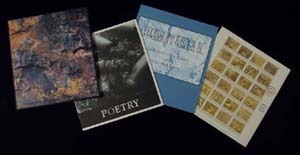 Pyracantha Press was established at Arizona State University in 1982 as the production and research imprint of the School of Art’s book arts program. The Press undertakes book arts projects which have particular merit in literary content, which result in visual or technical research, or which provide for significant collaboration between writers and artists or between artists. Publications of the Press are not done as class projects, but are produced with professional care and quality by the director, the staff printer, and graduate research assistants. The Press is directed by Professor John Risseeuw, who came to ASU in 1980 to establish a book arts program within the printmaking area of the School of Art. In addition to being a printer/typographer, he is a printmaker and papermaker. The shop is managed by Dan Mayer as the full-time book arts printer. The Press is also served by Prof. Gene Valentine as adjunct editor and a graduate research assistant.